1 of 6 Place one pork chop between two sheets of waxed paper and pound to 1/8-inch thickness. Repeat with all chops. 2 of 6 Bring a large pot of lightly salted water to boiling. Season pork chops on both sides with salt and pepper. Spread flour on a dinner plate. Place egg mixture in a shallow dish or pie plate. Place bread crumbs on a third plate. 4 of 6 heat. Coat a pork chop with flour, dip in egg mixture, then coat with bread crumbs. Repeat with all chops. 5 of 6 Cook 3 pork chops in skillet for 2 minutes. Flip and cook an additional 1 to 2 minutes. Transfer to a platter; add remaining 2 tablespoons butter to skillet. Repeat cooking with remaining 3 chops. 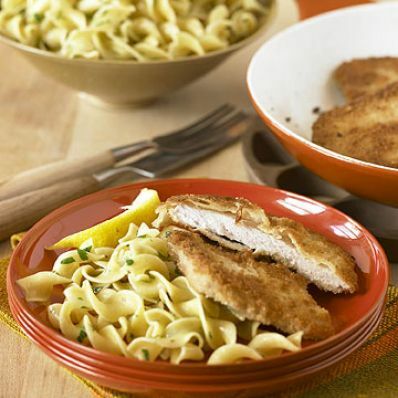 6 of 6 Drain noodles; place on platter with cutlets and sprinkle with parsely. Serve immediately. Per Serving: 1 g fiber, 480 mg sodium, 151 mg chol., 6 g sat. fat, 39 g carb., 13 g Fat, total, 412 kcal cal., 30 g pro.